Nearly 60 people were shot between Friday night and Monday morning across Chicago, according to police. Susan Carlson reports. 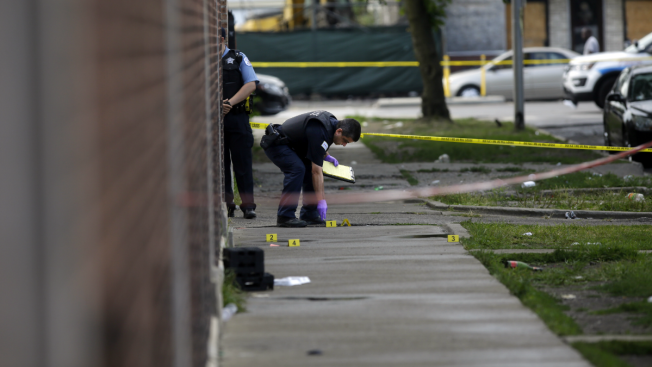 At least 74 people were shot between Friday afternoon and Monday morning across Chicago, according to police, marking a violent weekend with six shooting incidents that wounded at least four people at one time. Of the people who were shot between 3 p.m. Friday and 9 a.m. Monday, 12 have died, officials said. Among the victims was 17-year-old Jahnae Patterson, who was shot and killed at a party in the Lawndale neighborhood early Sunday. Authorities said she was standing on the sidewalk in the 1300 block of South Millard Avenue at around 2:34 a.m. when two gunmen approached and opened fire. Patterson was shot in the face and pronounced dead on the scene, according to police. Five other people - including two young boys, ages 11 and 14 - were wounded in the shooting as well. A vigil was held for Patterson Sunday night, with her mother saying she was an innocent victim amid the violence. "My baby just left the house. Twenty minutes later I get a call stating my baby got shot. And then when we get over there, they are shooting again," said Tanika Humphries, Patterson's mother. "This violence got to stop." The spike in violence led to a chaotic scene outside Stroger Hospital, as families packed hospital grounds waiting for word about loved ones who had been shot. Mayor Rahm Emanuel was quick to blame the violence on too many guns on the street. Emanuel and Chicago Police Supt. Eddie Johnson were expected to address the shooting incidents and police response at a news conference Monday morning.